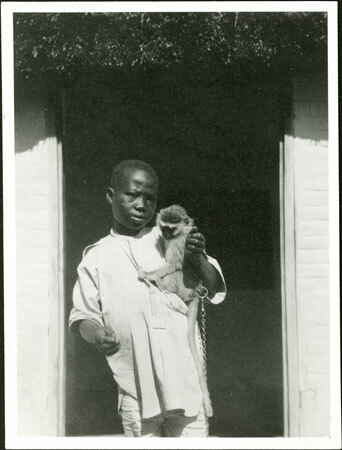 Portrait of a boy in a white shirt with a colobus monkey on his shoulder standing in the doorway of a brick-built building with a thatched roof (school?). This is possibly Evans-Pritchard's pet monkey seen in 1998.341.154, although it here has a belt and chain around its waist. Notes on print/mount - "23-5 EPA756"
Morton, Chris. "Zande boy with monkey" Southern Sudan Project (in development). 03 Jan. 2006. Pitt Rivers Museum. <http://southernsudan.prm.ox.ac.uk/details/1998.341.757.2/>.